Netflix has released the 5th Season of their hit original series The Ranch, and as per usual, the episodes are textured with lots of great songs from often overlooked and deserving country music artists, hand selected to help set the mood and theme of each scene. This season’s episodes feature traditional Canadian country artists Corb Lund and Whitney Rose, Americana stalwarts John Moreland and Amanda Shires, country legends Dwight Yoakam and Merle Haggard, emerging stars like Sam Outlaw and the Cactus Blossoms, and names like Eilen Jewell and Austin’s Ramsay Midwood. Once again the BoDeans act like the series house band, and Jeff Hahn also lends a lot of songs in the new series. 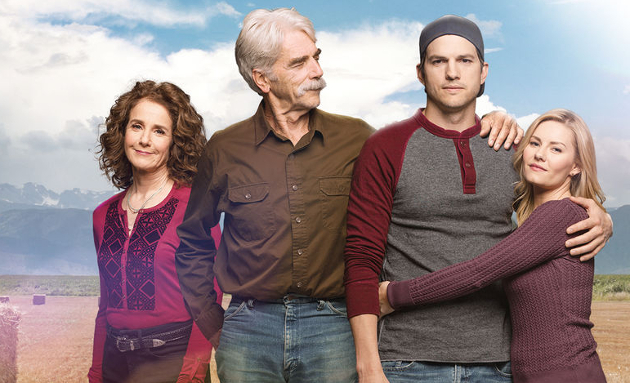 The Ranch stars Ashton Kutcher, Sam Elliott, Debra Winger, and Danny Masterson. Set in Garrison, Colorado, it’s about a washed up football player (Ashton Kutcher) who returns home to find his father (Sam Elliot) struggling to keep the family ranch going. The 30-minute comedy is filmed in front of a studio audience, and feels very much like a network TV sitcom, except there’s no commercials, and the dialogue will find the occasional swear word. The Ranch loves to embed music in scenes under the dialog, sometimes making it hard to pick out or Shazam. Thanks to music supervisor Mandi Collier for helping to supply the master list of The Ranch Season 5 songs below for those who hear a song they like, or hear one they recognize, but are having trouble placing or identifying. What are the odds , I hear a Moreland song watching it this morning and go straight here to see if the soundtrack is posted yet and it’s the first article up. Good job folks. I don’t watch any TV anymore really and am sure would agree if I were to see it, but regardless is cool that they’re putting some good / real music in front of the masses…. No, thanks. It’s definitely not for me. SHUT THIS SHAMEFULL SITE DOWN!!!!!! Before it’s TOO LATE!!!! AGGGGGGGHHHHHHHHHHHH HELP ME!!!!!! THANKS A LOT! I spewed my coffee all over myself when I read your reply. You’ve never heard of Steve Earle?? Guessing your comment came from too much drinking, but if not, you’re just an idiot. Off topic, but has anyone seen joe Nichols has a new series where he covers classic country songs. It’s actually really good. So far he has covered don Williams, Ronnie milsap, Merle, and Charlie pride. Just thought I mention it. I’m not sure about the lefty thing, but he does the original pose of the all the albums he’s covering, which I find pretty cool. anybody else think Joe is the spitting image of Lefty? Don’t remember when but I’m pretty sure I heard Josh Ward’s”Together” in episode 3. Having the same issue with Prayer for the Weary! I would love to purchase this song once it’s released! Please someone redo IT EXACTLY like it is! So beautiful! Please let me know once it’s released! I would love to purchase this single exactly as it was recored on the episode! Episode 6, end of reception. This is Season 3, not Season 5. I don’t see them getting a 4th season, let alone making it to 5. The music selections are one of the best things about this otherwise pretty weak show. The way they account for the seasons on this show is strange. If I said this was season 3, nobody would find it, partly because I already posted a listing for Season 3 a year ago. This is “Part 5” with each season broken down into two parts. At this point there’s no way to present it to where it would make sense to everyone. This is the 5th time they have released 10 episodes together. Ah, got it. Seems to be relatively common with cable shows, but I didn’t realize Netflix had hopped on that split-season bandwagon as well. That song back home by Micah Wilshire on season 2 can’t find it for some reason ? T’is nice to see some BoDeans songs on the list too! And adding “Rooster” from AIC is somewhat apropos given that its the name of one of the characters. Lovin’ the Dolly Parton song title references too. I’ll certainly be looking up some of the lesser known artists to hear their music. Overall, it appears to be a cool mix of songs except for the Thomas Rhett stuff. Mostly good music. I’ve even noticed a Shovels and Rope poster on the wall of the bar on the show. But really, I just feel like I’m watching a show where Kelso and Hyde move to Red’s cousin’s ranch for summer break. The songs are often so quiet as to be almost imperceptible. Great they are featuring so much good music but strange how hard it is to hear the majority of it. You just saved me the trouble of making this playlist myself… lol… Thanks Adam! More Quaker City Nighthawks please. Is there anywhere I can find “I’m your man” by the BoDeans? Stop making ranchers & farmers look stupid, look like assholes, drug heads & daily/nightly drunks. I truly expected better from this cast! So far the only thing good has been the music. I am now tired after S5 of waiting for the show to depict anything of what farming & ranching as well the families involved in them are actually like.